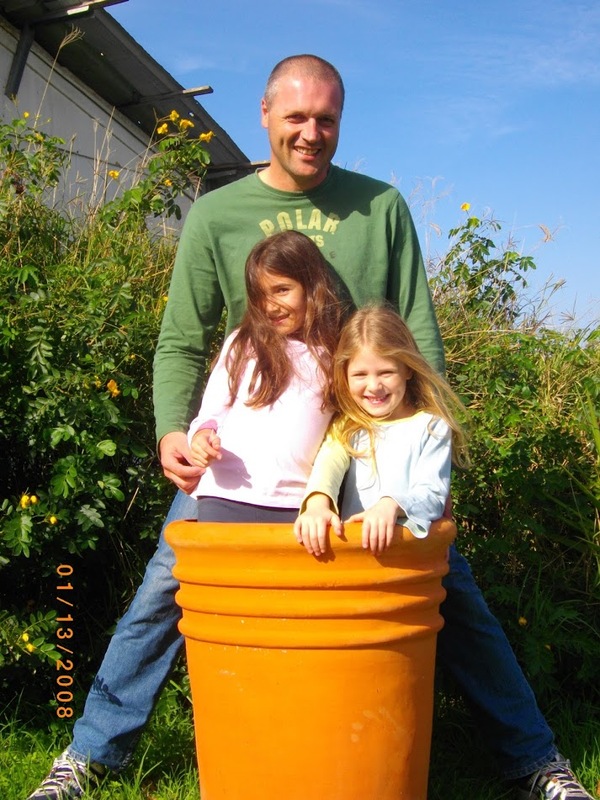 This transplanting tips page is dedicated to my beloved friend and partner Michelle. We took the pictures on her rooftop garden because we thought it was a shame that we were writing so much about gardening, while her garden lay neglected... So Mich, this one's for you! Transplanting tips - Although transplanting, also known as re-potting, is a term that relates to both pots and garden soil. Many of you (my precious readers) sent me Q's regard pruning shrubs, trees etc.. planted in pots. You ask ask whether pruning them will make them look better. The truth is that the photos you send me show me why your plants looks so sad... and no, pruning them isn't always the answer. 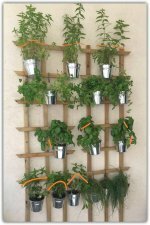 What I often see in the pictures is that your plant's roots don't have enough space to grow and develop, a situation that is very stressful to a plant. So, in this case pruning will only make things worse. Now, don't worry we will prune them soon, and it will help them to recover and grow new leaves, but first let's prepare. Note the date at which the picture was taken, I'll get back to that later on... lets move on. Well, I don't think I have to explain, but I will.. See the picture above... that's just one example of the Q's you all ask every day... 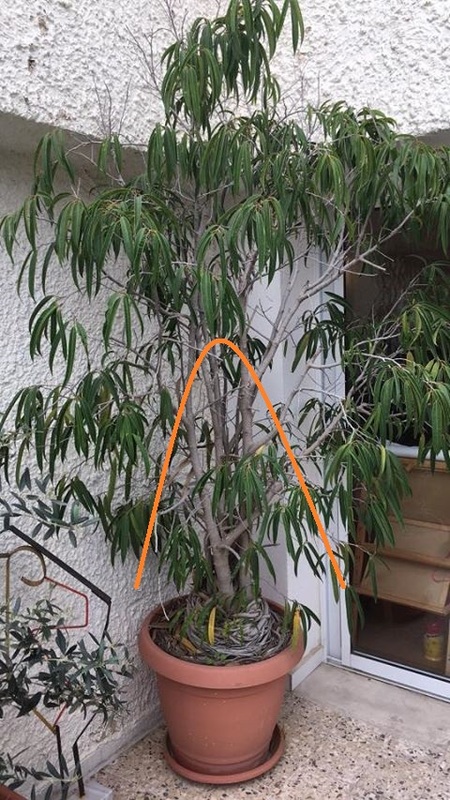 Does this plant need pruning? No. 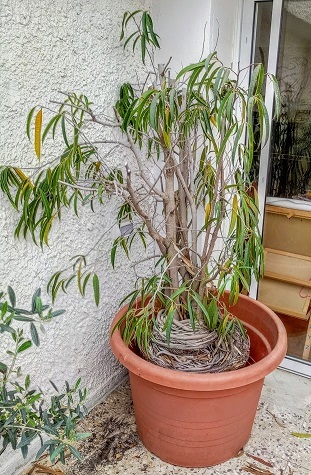 It needs transplanting (and then pruning), and BTW (if you ask me, I am sure there is very little soil left inside that pot. The roots have pushed it all away.) Anyway, you can see how thin the tree's structure is. And notice especially the roots that cover the main trunk at the bottom. There is no doubt that this tree is in bad shape, and is struggling to stay alive. So pruning it in this condition is a bad idea. My suggestion is to take the tree out of the pot ASAP and move it to a much larger one. So let's begin with how to do that?! and please read the short guide before doing any transplanting. Soil - get 50 liters of heavy garden soil, why heavy soil? because it's a planters garden and you want to save as much water as you can between watering intervals. Container gardens are exposed to winds which means the soil dries up faster, then gardens with plants planted in the ground. So, in order to keep the tree stabilized and the soil moist, most of the time use of a heavy soil would be my personal recommendation. Gravel, yes a bucket amount of clean gravel (the small stones), and not white gravel. You don't won't the roots in contact with the chalk. Why use gravel at all? A layer of gravel will allow better water drainage and will prevent the roots from blocking the drainage holes. Good drainage is a basic necessity in the success of any garden. And yes, smile it's a fun activity - you'll see. Pruning time - You may say it's brutal, and you would be right, but it all depend on what you would like to achieve. If I wanted to keep the plant's height, I would just go and buy a new tree, which is always an option but not much of a transplanting tip :). But, if I want to keep my tree and encourage vigorous new growth, I will need to prune hard to make it happen. 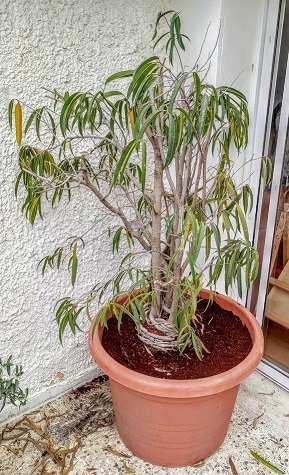 If you transplant the tree without pruning it,you will end up with a new pot and more space for the roots, but with almost no new growth. As you must have understood, the orange mark shows the cutting points. Don't worry, I promise it will worth it. Transplanting tips for pruning - Once you have cut the stems lay the plant down on the floor and begin to pull it out of the pot. If it is too difficult to pull the plant out of the pot, take a look at the bottom of the pot and see if there are any roots coming out, usually, that would be the cause of the difficulty. If you released the roots and it still doesn't come out of the pot consider braking the old pot (a hammer will do the trick). Of course it's your call, but if it's an old plastic pot, I generally have no problem with it. On the other hand, when it comes to ceramic or terracotta pots I will do everything possible to keep them in one piece. Plant and roots are out? Great job! place the new pot in it's new location. Lift the plant and place it at the center of your new pot. 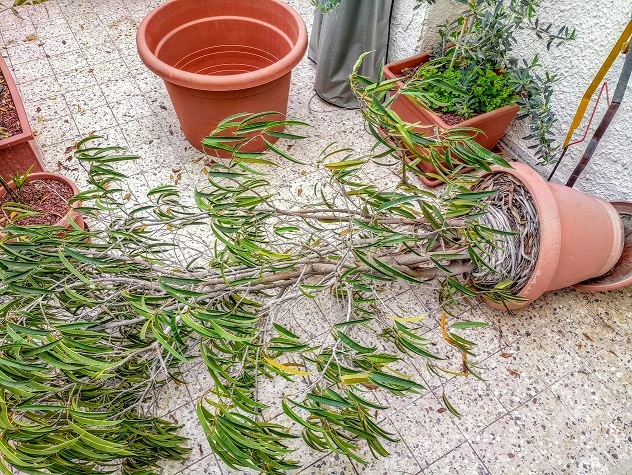 Just to make it easier, don't try to lift the tree off the floor (bad for your back), rather place the new pot behind the roots and drag the tree by it's roots towards the pot. Like pulling up pants. After placing the tree in the center of the new pot, pour in gravel and spread it around the tree's roots (see picture on the right). Cover the bottom of the pot around 2 inches height. You can take the opportunity to prune some of the longer, thicker roots using your pruning shears, don;t cut too hard, just the edges. Fill the pot with new soil around the plant's roots using your hands to tighten the soil around the plant. Use a gentle stream and tighten the soil again while the water seeps into the spoil and reaches the roots. Your goal is to release all of the air that has been trapped between the roots of the tree from the transplanting. That's it! Your plant has been relocated. well done! Now, as you have more space around the base of your tree (because it's now in a bigger pot) you could plant some annuals around the base, which always adds a little color and a smile.